One of my favourite things about wearing black tie is silk socks. 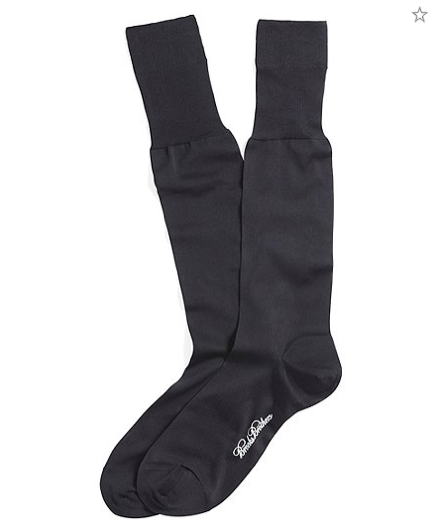 In particular, the lovely pair of Brooks Brothers black, silk, full-calf socks I own. They rarely get worn except at black-tie events, and are therefore as much a part of the ceremony as the bow tie or the shirt studs. Every time I wear them I am amazed by how cool silk is. Somehow, they feel cooler than bare legs. Each time an ankle is exposed or you remove a shoe, a gust of cold air rushes over the skin, as if it the silk were taking breath. Bare skin doesn’t do that. Silk is used in wool mixes for a similar reason. Summer, cashmere sweaters often contain a percentage of silk as it is good at keeping you cool in heat and warm in cold. While wool on its own is very good at ventilation (which is why all the old cycling jerseys were made from loose-weave wool), the silk makes the material a good summer weight. The same applies to socks. Many cashmere socks contain a percentage of silk in order to make them more usable day to day. (I recommend the Pantherella wool mix sock, which contains 17% silk alongside cashmere.) Without silk, cashmere socks are really only good for the coldest of winter days or for wearing around the house. Which brings me to the title of this post. If silk is so breathable and comfortable, why does no one sell silk socks for everyday dress use? A 100% silk sock has a sheen to it, and is a little transparent, so I can understand why these would not be practical. But why not silk/cotton mixes? Surely a minority percentage of silk in a cotton sock would make it more breathable without any noticeable difference in texture? Both of these are good reasons why silk socks are fine for special occasions – they are worn infrequently and usually only in the evening. However, a silk/cotton mix sock would suffer far less from these problems. The biggest reason they are not manufactured in bulk, in turns out, is economy. Combining the two is expensive and the market is untested. Instead, PA Crowe recommends Cotton Lisle – a much finer cotton that has some of the properties of silk. But I maintain that someone should begin offering cotton/silk mix socks. Has anyone seen any on sale anywhere? You can follow the discussion on Why no silk socks? by entering your email address in the box below. You will then receive an email every time a new comment is added. These will also contain a link to a page where you can stop the alerts, and remove all of your related data from the site. I can’t say.. I’m still trying to find full-length pairs of socks in a decent pattern and of a decent quality that don’t cast 20 dollars a pair.. so sadly, I make most of my sock purchases at Costco. Any suggestions? I promise to keep my eyes open for silk blended socks though..
Great socks. But I guess it can be wore out easily. Right? I find the longer socks a little short and narrow at the calf if you have much muscle there. French socks maker Bleu Foret offer cotton/silk blend socks — and they are very nice indeed! Have you tried the ones from Mazarin that Mes Chaussetes Rogues carries? And if so, do they have too much sheen to them for wearing with “business suits”? I have never wore these types of socks because I don’t like black colored socks. I always wear colored socks but by telling lots of qualities of black silk socks in this post you have changed my opinion. Now I am thinking to try these socks then I will tell you that how I feel by wearing these socks. These are dress socks but are very nice and last a long time. I buy them for my husband.